As a locally owned business we've taken pride is serving the Roanoke Valley and surrounding areas since 1949. We provide service for grocery stores, convenience stores, restaurants, processing plants, distribution centers, and all other commercial and industrial businesses. With over 200 years of combined experience, our expert staff can repair all makes and models of commercial and industrial refrigeration and cooling systems. We have extensive knowledge and understanding of today’s modern computer control systems found on many refrigeration systems. We are fully insured and have a Class A contractor's license with Electrical and HVAC classifications in the state of Virginia. All of our technicians are certified in refrigerant handling and have a professional knowledge and understanding of all the newly developed alternate refrigerants and blends available today. We at Kessler Refrigeration & Electrical Service know that when technical issues arise, your business's productivity suffers. That’s why we offer professional, dependable service in a timely manner. 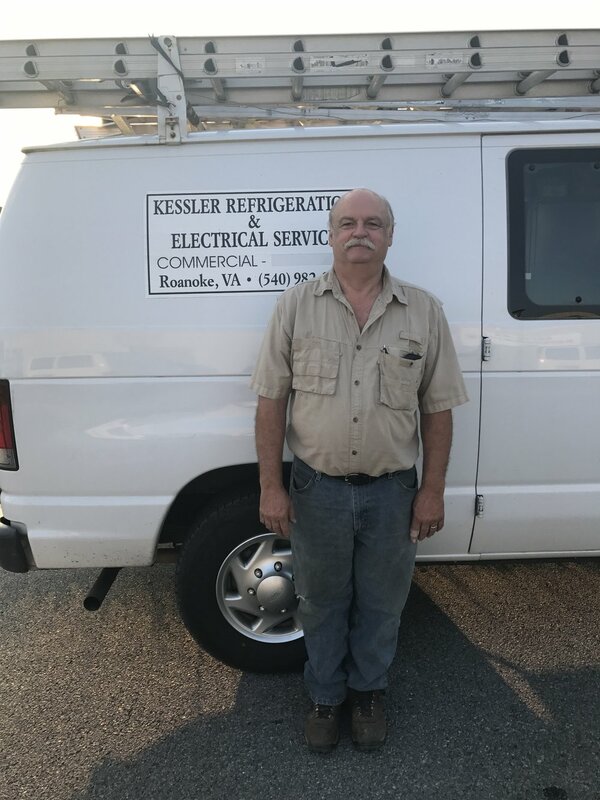 At age 16 Ken joined Kessler Refrigeration & Electrical Service as a General Laborer during his high school summer break. That was in 1973. He's been here ever since. Over the years he worked his way up through the company holding the positions of Pipe Fitter, Service Technician, Installation Foreman, and, starting in 1988, as General Manger. As GM Ken managed all the day-to-day operations of Kessler including supervising six installation crews and overseeing the service department. In 2010 he took over the business as the owner. During his 40-plus years experience, Ken's pride in his work has only grown.